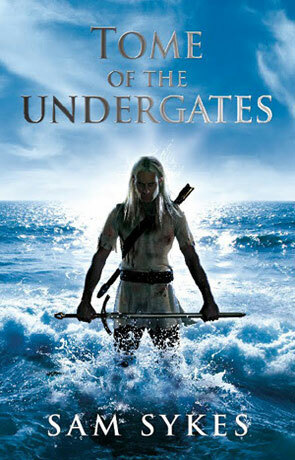 Tome of the Undergates is the first volume in the Aeons' Gate fantasy series by Sam Sykes. Lenk is in theory the leader of a band of "adventurers", in practice he struggle's to keep control over the unruly misfits - with Gariath the dargon man seeing humans as little more than prey, only happy in a fierce fight and Kataria the Shict despising nearly all humans - he has his work cut out. The humans aren't much better either, when they're not insulting each other's religions they're arguing about pay and conditions. When the ship they are travelling on is attacked by pirates things begin to get steadily worse, cumulating in an invincible demon joining the fray who steals a manuscript containing all the information you've ever wanted to know (but were too afraid to ask) about opening the undergates. Behind these gates lurk countless invincible demons, the manifestation of all the evil of the gods - who now want out. The thing that first strikes you about this novel is the confidence that the author extrudes, writing in an intelligent and thoughtful voice with a cheeky and quick witted tone that immediately makes the reader feel comfortable and provides an almost irresistible hook into the narrative. The quality of the prose is generally good however it does seem to lurch from the overly elequent, almost Lovecraftian style all the way to an almost pulp fiction quality at the drop of a hat, but once you get used to this miss-match of wordplay it actually becomes quite endearing and through the writers relentless wit and style it actually works - you just have to throw off your inhibitions and accept the novel as it is. You can almost imagine the author having arguments with the characters within his own head before transfering them to the page, while this does lead to some very effective dialog and I can understand that the author is trying to show us just how unruly this band of adventurers is, it also get's a little annoying sometimes and you almost feel like telling them to just shut up, ocassionally even wondering why Lenk himself isn't berating them more often (hey Lenk you call yourself a leader?). The book has an almost relentless vivacity about it, it's a novel with more energy than a toddler who's overdosed on sugar and then found his parent's stash of redbull - a raw intensity that kicks and screams throughout leaving the reader rapidly turning the pages to keep up. I loved the characters, from the huge war hungry, blood thirsty Gariath to the holier than though yet kind and gentle Asper they are all full of quirky mannerisms and well crafted persona's which all adds to the ambiance and helps to the reader to engage with the characters (arguments not withstanding). The combat settings are equally impressive full of high octane action and plenty of gore and they are also quite frequent too, they feel almost like a more family friendly, toned down Gemmell or Remic. The story arc itself is interesting, if not wholly original and has plenty of intrigue, plot twists and suprises to keep you glued to the pages. For a debut novel Tome of the Undergates is very impressive, it has a real style that's very distinct and all it's own. There are a few rough spots and a very "young" feel to the prose in places but in a way these imperfections do add to the charm (in the same way small imperfections can add to beauty). Tome of the Undergates is daring, blisteringly fast and full of a real vibrant energy - I can't wait for Black Halo, the next in the series. Written on 8th May 2011 by Ant.